Two farmers had stopped in the church at Rho on April 24, 1583 to pray before the ancient image known as Our Lady of Sorrows. They had often stopped in and were very familiar with the image. On this day they were stunned to see that the eyes of the Madonna were swollen as though the image had been crying. Thinking that they had made a mistake, they went closer to the portrait. At that moment tears of blood began pouring from her eyes. They were overwhelmed and much anguished that our Lady was so sorrowful, but they went to tell others to come and see the miracle. Someone suspected that the blood might be peeling paint, so a handkerchief was used to catch the tears of blood. Later it was obvious that the stain was made by blood and not paint. It is not known how long the tears of blood lasted, but soon the little church was crowded with excited parishioners who were witnesses to the event and the news spread to Milan and surrounding villages, and to the Archbishop, St. Charles. He placed Carlo Bascape in charge of the episcopal investigation. A notary took depositions from 40 witnesses; the results were sent to the Holy See. The miracle of Our Lady of Sorrows was declared authentic and St. Charles promised his parishioners that he would build a basilica to honor Our Lady as Our Lady of Sorrows or the Griever as the local people called her. He died after the cornerstone had been laid. Today the basilica is decorated with splendid carvings and priceless paintings. There are several large chapels, one of which is dedicated to St. Charles Borromeo. The custodians of this magnificent church are the Oblate Missionaries of Rho, known as the Missionaries of the Griever. Their founder was the Rev. Giorgio Martinelli [1655-1727], who was declared Venerable by Pope Paul VI. In the sacristy of the basilica is a tabernacle-like safe in which is kept a large silver reliquary in which is visible behind a crystal oval, the linen handkerchief stained with the bloody tears of the Madonna. The miraculous portrait ---- we do not have a good photo, which we someday hope to have ---- has the place of honor in the basilica. The yearly anniversary on April 24 is celebrated with impressive ceremonies, while the Feast Day of the Sorrowful Mother, which is September 15, is commemorated more solemnly. Her Feast of September 15 is one day after the Feast of the Triumph of the Cross. The first known outpouring of honoring Mary as a Sorrowful Mother go back at least as early two or more centuries before St. Charles Borromeo and the devotion has its roots in Scripture. Both the Dominican and Franciscan Orders were instrumentally in spreading this devotion, along with the Servites. As we said, she is portrayed mostly as a Pieta with the dead Christ in her lap, to resemble the original painting in the basilica at Rho. However, she is also popularly depicted with a crown of thorns in her hands, or with her Immaculate Heart pierced with thorns, or beneath the Cross in grief and most often of all, like the image on this page, which is a popular rendition of the famous one by Carlo Dolci. All are accepted by God and her as appropriate to Christ's wish for devotion to His Sorrowful Mother to be known and practiced. Various mystics and Saints have indicated as much. 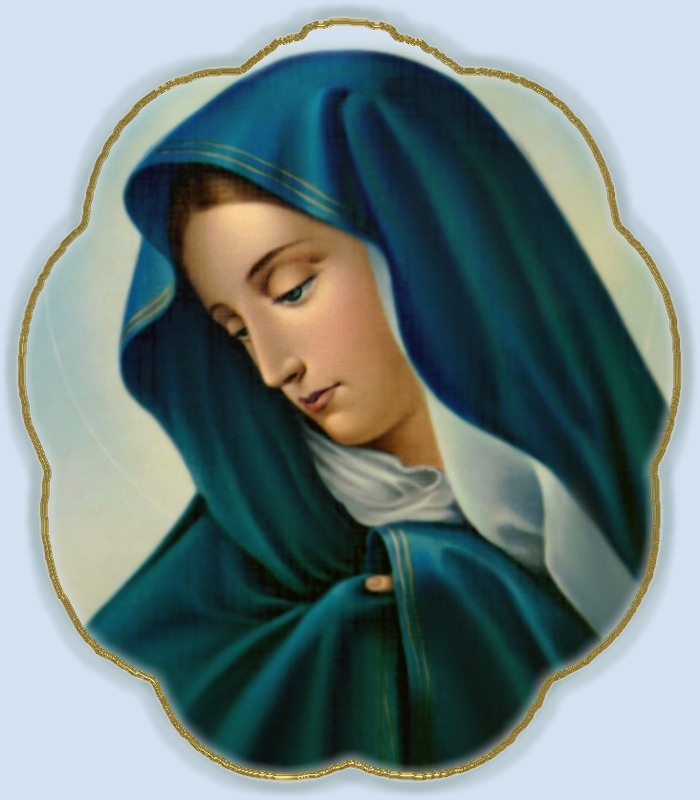 We are devoted to all the images of our Lady of Sorrows and have chosen what we think is a fair representation of the range of images possible for display. We tried not to have too much duplication from last year and chose less color and more sepia in some of the sections. The devotion to Our Sorrowful Lady is growing in modern times, almost unprecedented, but of course it is very precedented because it is in accord with the Will of God. Our Mother is very much grieving, as Our Lady of Fatima. as Our Lady of LaSalette, as Our Lady of Akita, and so forth. Could it be any different in this time of worldwide apostasy and open rebellion against the rights of God and the respect and honor due His holy Mother?